In this video, we will discuss the advantage of using _ViewStart.cshtml. Please watch Part 59, before proceeding. 2. Maintenance overhead. To use a different layout file, all the views need to be updated. ASP.NET MVC 3, has introduced _ViewStart.cshtml. Specify the Layout property in this file and place it in the Views folder. All the views will then use the layout file that is specified in _ViewStart.cshtml. This eliminates the need to specify Layout property on each and every view, and making them more cleaner and maintainable. 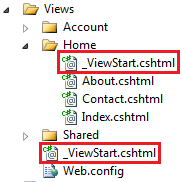 If you want a set of views in a specific folder, to use a different layout file, then you can include another _ViewStart.cshtml file in that specific folder. When I use _ViewStart.cshtml file, can I still set Layout property on individual views? Where else can I specify a layout file? Layout file can also be specified in a controller action method or in an action filter. We will discuss action filters in a later video session. Can we write some logic in "_ViewStart.cshtml" to dynamically specify which layout file to use? Yes, the following code will change the layout file to use based on the browser type. All partial views in my application are now using the layout file specified in "_ViewStart.cshtml". How do I prevent these partial views from using a layout file? Details action method below, returns "_Employee" partial view, and is using the layout file specified in "_ViewStart.cshtml"
To prevent this partial view from using the layout file, specified in "_ViewStart.cshtml", return "PartialViewResult" from the controller action method as shown below. What will be the layout file extension, if VB.NET is my programming language? In our next video, we will discuss using named sections in a layout file. Your doing a great job. I am very much Thank full to you. In this section i.e. part-60-viewstart-in-aspnet-mvc.html, As you told we can specify layout file path in viewstart, so that maintenance will be easy. But I have a question, why can't we specifying layout file path in web.config. If we specify in web.config, we can read that entry in Razor View right. So, the problem will be resolved right. Can you give me reply for this. you are doing a good job Venkat, well done..